One of the prototypes I am currently working on is the Hand-Substrate Interface. This was originally conceived to be part of the Data HarVest, but is now it’s own device. 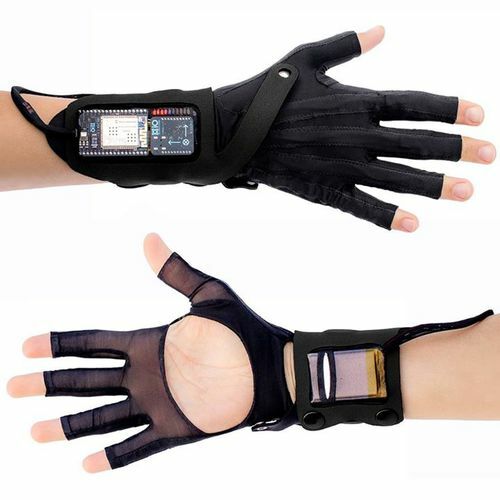 The concept for Hand-Substrate Interface is to create a wearable device that can be worn around the hand to capture information about the substrate surfaces, such as soil and wood. Rather than having to pull out probes to receive quantifiable data about the environment, the user would be able to implement gestures performed during a mycological foray, such as touching with the hand, to obtain this information. The first iteration of this used a work glove as the base material for which sensors were placed onto. One of these sensors included a soil moisture sensor that is deconstructed so that it can fit on the glove. A soil moisture sensor typically consists of two probes that function as a variable resistor. These probes are placed into the ground to measure the conductivity between the two points. The more moisture or water that is in the earth, the higher the conductivity will be between the probes, resulting in lower resistance. The sensor is built into a glove by embedding conductive materials so that index and middle fingers of the gloves becomes the probe. When the two fingers are inserted perpendicularly into the ground, a reading can be taken of the current moisture levels. As a wearable, the sensor becomes a more portable and readily accessible to be used, while the gesture required for taking a reading allows the user to interact with the physical environment in an intimate manner. 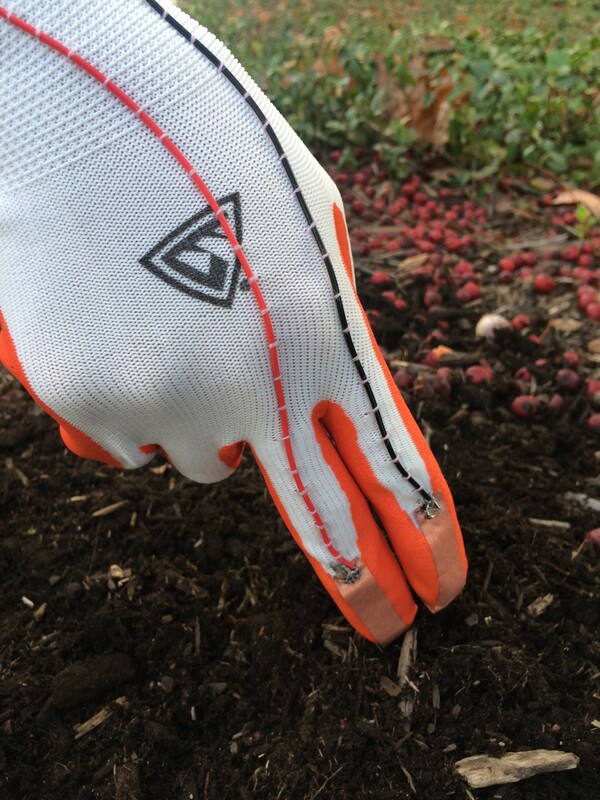 Since only two fingers of the gloves are currently being utilized for the soil moisture sensor, there is potential to add additional sensing capabilities to the other fingers. Although the glove provides a structure for the components and sensors to be mounted onto, the glove is also a barrier for the fingers’ direct interaction with the environment. In building these prototypes, one goal is to build wearable devices with embedded environmental sensors which this prototype addresses. However, another goal is to facilitate a more aware interaction with the natural environment and the use of the glove would mask this action. This would mean not only collecting qualitative data from using the probe, but also allowing for a qualitative experience, such as allowing the user to also feel how wet the substrate might be, in addition to obtaining a reading. The Hand-Substrate Interface is currently being reiterated in two different ways. 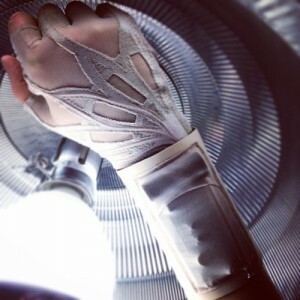 One is revisiting the concept of the glove, but utilizing different materials to allow for a more tangible interaction. The materials include stretchable fabrics such as knits so that the glove can sit closer onto the user’s hand, along with textiles with a more open structure such as mesh and netting so that direct contact can be made with the substrate, while providing a surface for the circuits can be embedded into. The design for the glove iteration takes inspiration from fashion designer Rachel Freire’s work in e-textiles. In working with performers and musicians to build wearable devices that augment their performance, Freire has developed a process to more seamlessly embed the technologies into garments that are worn close to the body, such as gloves. One of these projects, Mi.mu, is a collaboration between technologists, designers and musicians to build a glove that can control a musical interface with gestures. Through several iterations and tests, they have created a functional device that an artist is able to use, without hinderance to their movement. 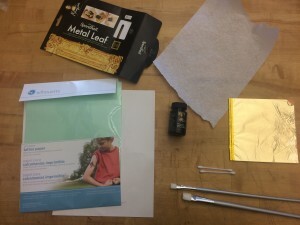 Another iteration of the Hand-Substrate Interface is to use conductive temporary tattoos as a method to rethink the relationship between how technology resides on the body to interact with environment. By installing the probes directly onto the body by adhering the traces to the skin via temporary tattoos, there will be little to no barrier between the hand and the environment. A wrist band will be constructed to house the electronic components such as the microcontroller and interface to work with the sensor. 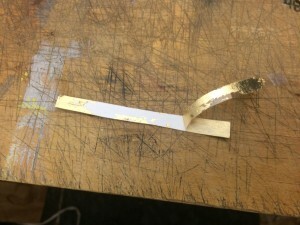 The wrist band will be connected to the conductive tattoo with contact points located on the inside of the band that will be worn against the skin. 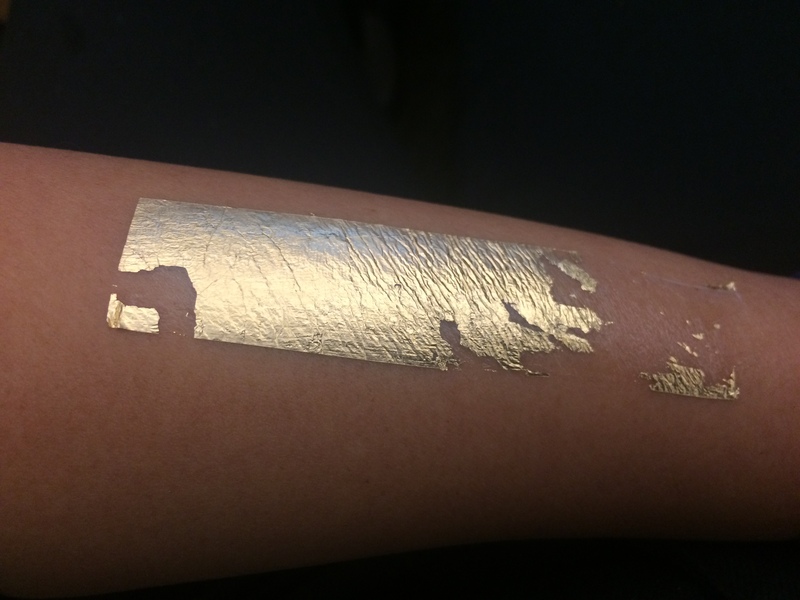 The conductive temporary tattoo method was first tested based on the work in DuoSkin by Cindy Kao, et al. In their paper, the group documents a process of creating temporary tattoos using gold leaf adhered to temporary tattoo paper and then applied onto the surface of the skin. This method would create skin-friendly circuits that are worn on the body that can also provide a basis for surface mounted LEDs. 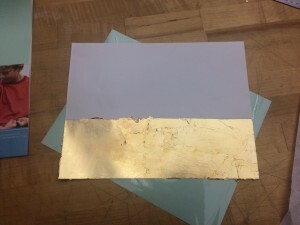 The materials for this process utilizes gold leaf, gold leaf adhesive, and blank temporary tattoo paper which consists of one sheet of silicon material on a paper backing that acts as a base and an adhesive sheet. 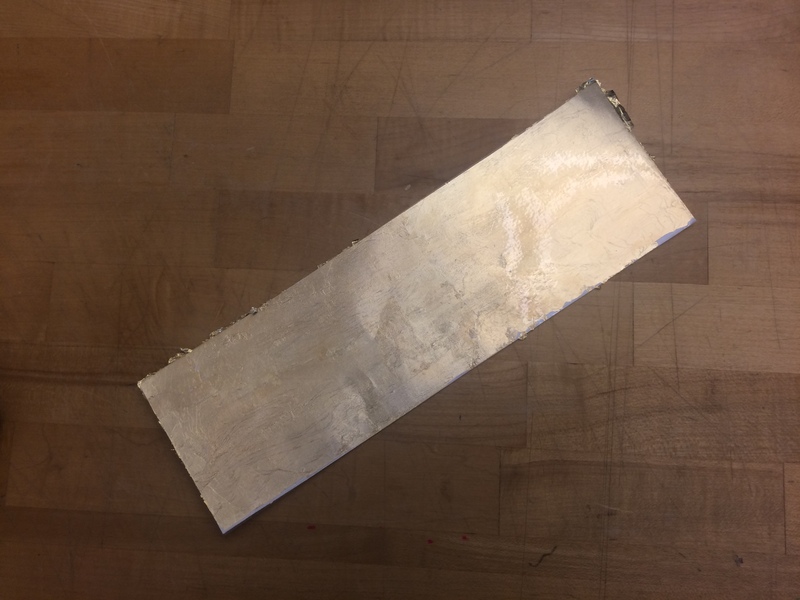 To test out this process, I made a rectangular piece (approximately 4″ x 11″) of the temporary tattoo with gold leaf to test how it will apply to the skin, rather than using a stencil. I first coated a section of the glossy side of the paper-backed sheet with gold leaf adhesive and allowed it to cure for 30 minutes. Afterwards, I applied a layer of gold leaf onto the surface and trimmed the paper down. The adhesive sheet was then applied so that the whole gold leaf area was covered with a clear plastic sheet. To use as a tattoo, I cut out smaller rectangles of the tattoo out using scissors. However, when peeling off the clear plastic sheet to expose the adhesive layer, some of the gold leaf layer was pulled off the silicon layer. In the DuoSkin layer, the authors did discuss applying multiple layers, perhaps to guard against this happening. This could also be a result uneven application of the gold leaf adhesive as well. To test if a piece could resist the plastic area being peeled off, a larger rectangular piece was cut off with moderate success. The sticky exposed side was then placed downwards on the skin and a wet towel was applied against the paper, thoroughly wetting the tattoo for about 15 seconds. The paper then slid off and the tattoo was applied to my forearm. Although the result is not totally pristine it does validate the procedure put forth the DuoSkin group. By utilizing materials for creating temporary tattoos, this process ensures a skin-friendly method of building circuits onto the body. However, the insulation that the adhesion and silicon used in the temporary tattoo process does create a hinderance in thinking about the overall design of the probe. Using a multimeter, it was hard to get a stable read on the silicon surface of the tattoo. By peeling up a bit of the tattoo to get a reading on the adhesion layer, there was continuity with fairly low resistance (approximately 5 ohms across). However, since this is the layer that is supposed to sit against the skin, it is difficult to access the layer without ripping the surface of the tattoo. The ability to have exposed traces is important in considering building the tattoo into a soil moisture sensor. The two traces that create the probe need to be able to make contact with the earth in order to obtain a proper reading. In researching other methods for safely applying gold leaf to the skin, I came across makeup tutorials for applying gold leaf as a highlight to the face, body and even hair. In Fall 2011 and again in Winter 2014, there were brief trends in which gold leaf accents was popular enough to warrant many online tutorials to guide people who were curious about incorporating this trend into their look. Based on the “How to Make Your Holiday Makeup Look Super Fancy” tutorial put forth by fashion blog, Refinery 29, gold leaf can be applied directly to the body using “eyelash glue, Vaseline, coconut oil, and jojoba oil”, although gold leaf should be able to adhere somewhat to the skin without an adhesive. In Honestly WTF’s “DIY Gold Leaf Faux Jewelry”, the author suggests using spirit gum, a solution usually used in costuming to adhere a range of false hairs and prosthetics directly to an actor’s skin. 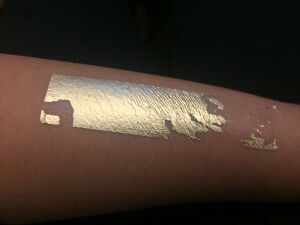 Because only one layer of adhesion is applied to adhere the gold leaf to the skin surface rather than the insulating silicon top piece for the temporary tattoo, the gold leaf would have exposed traces that would allow for reading the soil moisture through sensing changes in resistance. TO BE CONTINUED as a I acquire eyelash glue // other skin safe adhesives!